One of my all time favorite horrors and one of my favorite John Carpenter flicks, in fact, since I was too young to see Halloween when it came out, this was the first Carpenter film I saw in a theater and the flick that started me on my love of his movies. The Fog tells the story of the 100 year anniversary of the small coastal California town of Antonio Bay and as the town prepares for it’s centennial celebration, a dark secret is revealed. Legend has it a leper colony paid the founders of Antonio Bay a lot of gold to let them settle nearby but, they were betrayed and murdered, as their ship was lured onto the rocks to crash and sink on a fog laden night. All were lost but, now a horde of vengeful spirits returns from the sea, wrapped in a surreal fog, to make the descendants of those who wronged them, pay with their lives. 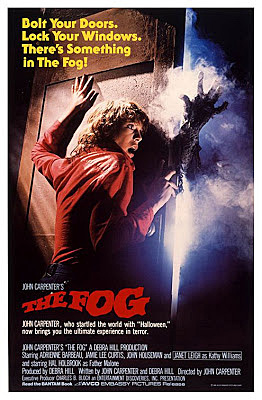 The Fog focuses not on a main character but, a group of central characters whose individual experiences during this supernatural crisis bring them slowly all together for it’s tense and creepy final act set in the town church. A good cast, including Jamie Lee Curtis as hitchhiker Elizabeth, Tom Atkins as local fisherman Nick, Janet Leigh as centennial chairwoman Kathy Williams and Adrienne Barbeau as single mom and radio DJ Stevie Wayne, give life to this ensemble and make them characters we like and care about so, we fear for them when they are placed in harm’s way. Add to that Hal Holbrook as the town’s alcoholic priest and a host of Carpenter regulars…with even a cameo by Carpenter himself…and you have a film wonderfully filled with a variety of characters who are all potential victims for the marauding phantoms. As for those phantoms, lets not forget to mention the ghostly Captain Blake (FX man Rob Bottin) and his vengeful crew who are portrayed with in-camera practical FX. This makes them quite spooky and gives them a heavy dose of menace and a lot of effectiveness when they are on the attack. There is loads of atmosphere and some very solid scares and suspense created by Carpenter, along with some great cinematography from frequent Carpenter collaborator Dean Cundey, which makes this a good, solid, old-fashioned ghost story and a fun Halloween season treat. Carpenter again delivers a score which adds chills and foreboding to his tale of ghostly revenge, much like he did for Halloween and he starts the film off perfectly with a chillingly fun opening sequence featuring veteran John Houseman as a crusty sailor who likes to tell kids scary stories. It sets the mood for the thrills and chills yet to come. This classic was made back when there was no phoney CGI, just solid make-up effects from master Rob Bottin (who went on to do The Thing’s FX for Carpenter) and some very basic down to earth smoke and mirrors style visuals, that are as beautiful as they are scary. 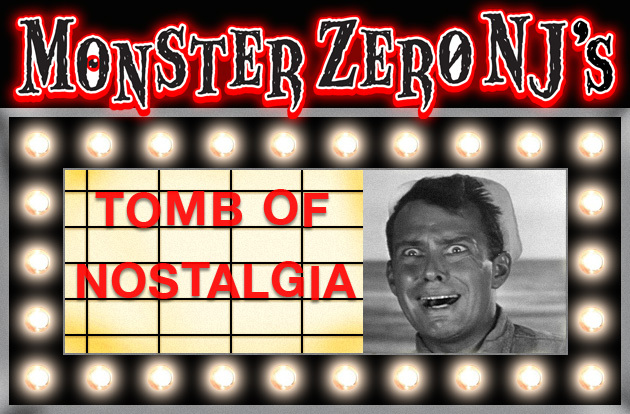 A great flick the likes of which they rarely make anymore and one of MonsterZero NJ’s must-watch flicks during the Halloween season! As stated, the film was just released for the first time on blu-ray from Scream Factory with all the extras from previous releases plus an added new commentary track with Barbeau, Atkins and Tommy Lee Wallace and two really fun and informative interviews with Jamie Lee Curtis and Cinematographer Dean Cundey who also supervised the absolutely gorgeous new transfer!